“This weapon is your life.” Obi-wan Kenobi knew the importance that a lightsaber held to a Jedi. A master of the force would allow the lightsaber to become an extension of the body. Considered to be a "civilized" weapon, they were primarily used as a defensive weapon, since it would be rare for a Jedi to be on the attack. Effective against deflecting blaster fire, Jedi were able to protect themselves from the "uncivilized" weaponry of the galaxy, and skilled Jedi such as Obi-Wan were even able to manipulate the blaster fire back at their target. If you feel up to the task, take up the role of the famous Jedi and select your weapon wisely. 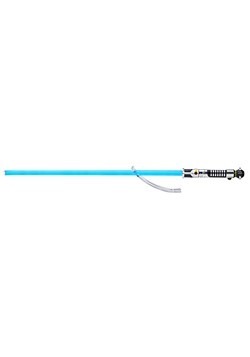 Our Obi-Wan telescoping lightsaber is perfect for any costume, child or adult. 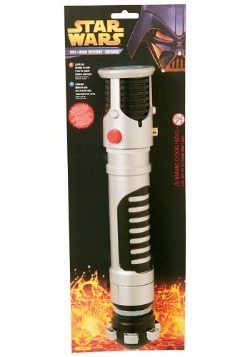 But if you feel particularly strong with the force you should get our Obi-Wan FX Lightsaber. It has a collectors quality build and with it's detachable polycarbonate blade it will have you ready to go to a galaxy far, far away. You will be the star at the next convention, or you can start a YouTube channel with lightsaber battle lessons!